Figure 10-18.Slide fasteners. figure 10-18. Figure 10-19 shows the parts of an the slider, which, when moved, displaces teeth at interlocking fastener. 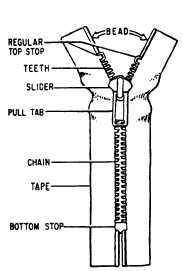 Interlocking Slide Fastener Construction An interlocking slide fastener consists of two chains of teeth (hollow cones or scoops) facing each other. When brought together at the proper angle, each tooth fits within the scoop of the tooth opposite it. When closed, the interlocking slide fastener teeth cannot be parted except through the use of the proper angle for meshing and unmeshing. The small clips (stops) at the top and bottom of the interlocking slide fastener are designed to prevent the slider from running off the track. Separating- type slide fasteners do not have a bottom stop, but are equipped with a pin on one side and retainer arrangement on the other to allow the two parts of the slide fastener to separate. Interlocking Slide Fastener Operation Ordinary interlocking slide fasteners are designed for flat, smooth operation. Both hands are required for proper functioning. The chains should be stretched taut with one hand and the Figure 10-19.Slide fastener 239.308 parts. 10-16 slider worked (without force) with the other. When operating an interlocking slide fastener installed in a garment of soft nappy material, or lined with wool or fur, do so with care to prevent the nap or wool from jamming the slider. Very often grease or oil deposits lodge between the tiny hollow parts of the teeth and accumulate dirt and lint. This causes stiff operation of the slider. A dirty or gummed chain should be cleaned with an old toothbrush or a pipe cleaner saturated with Stoddard solvent or other similarly approved cleaning solvent. After each cleaning, the chain should be lubricated by applying one drop of oil or a small amount of graphite between your thumb and forefinger and running the chain up and down between your fingers several times.